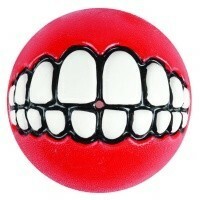 The Rogz Grinz Treat Ball Red is a funny and entertaining toy that your dog will love playing with! When your dog picks up this toy in its mouth it will look like it is grinning! Simply pop some delicious treats into the hole at the back of the ball and then watch the hilarity unfold! Made of medium density SEBS material which will float on water, perfect for fun games of fetch! Soft enough not to hurt your pet's teeth but firm enough to bounce. This is hilarious! Not only can you have hours of fun watching your dog smile back at you, but this is also a treat dispensing toy that will keep your dog happy too.